Give these stylish opera glasses to the theatre lover in your life. With a beautiful burgundy finish and gold trim, the saxon 3x25 Opera Glasses with Handle and Light use a center-focus knob to make them as functional as they are elegant. They include a built-in push-button LED light to help you find your seats and enjoy the show. Do you love going to the theatre but never get to see everything you want? 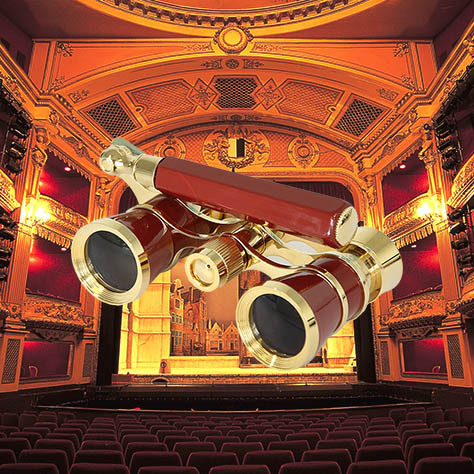 You won't miss another moment of your favourite Broadway show or opera performance with the saxon 3x25 Opera Glasses with Handle and Light (Gold)! These 3x magnification glasses have a convenient LED push button light that will help you find your seats or get a quick glimpse of the program booklet in a dark theatre. With an adjustable handle, these glasses are the perfect fit for everyone. Never miss another breathtaking moment of your favourite show! Imagine a perfect blend of silver and gold tones on your favourite pair of opera glasses. The saxon 3x25 Opera Glasses with Handle and Light (Gold) is a wonderful addition for your opera and theater outings with its 3x magnification, foldable handle and LED light. Compact and classy - These opera glasses promises to bring you closer to all the action on stage.